Breakfast. Lunch. Dinner. Awesome. Sugar Bowl’s slogan doesn't mince words. Daily and weekly specials on the board. Last week I was granted two great excuses to visit this place. Once for a reunion with some friends I met while studying abroad, and later in the week for a friend’s birthday. Though I live very close, my bank account (and no doubt my liver) are grateful for the infrequency of my visits. Not only does Sugarbowl have what is perhaps the best beer list in town, but the food is equally reputable. The menu is short, but rife with unique dishes you would never come across elsewhere. The Sugar Bowl is always filled to the brim with an eclectic mix of students, professors, and other colourful Strathcona County folk. Be warned – you will wait in line for a table. No matter what time you visit. I have usually been met with friendly service, though entrees take their time in arriving during a dinner rush. One could argue it as an excuse to have another beer. The perfect sweet and spicy shareable. I used to be fond of the cheese plate as an appetizer. Sometimes all I want with my beer is a cheese to pair it with. However, I found during my recent visit that the variety of cheeses had decreased, as did the portion size. The smoked cheddar I received the first time was sorely missed. Cheese aside, the best beer snack that Sugarbowl offers is definitely the Smoked Paprika Popcorn. Served with a wedge of lime, this shareable is the perfect combination of sweet, salty, and spicy with that addictive crunch you crave. Chicken and Waffles was the first item I ordered off the menu many years ago. At one time, the fried chicken was served in little pieces, though it is now offered thinner and wider cutlets. I prefer the newer serving style, as I can more easily distribute the chicken amongst the entirety of the waffle. Though I have ordered this dish for both brunch and dinner, I tend to prefer it for the latter because of its sugary, buttery, richness. 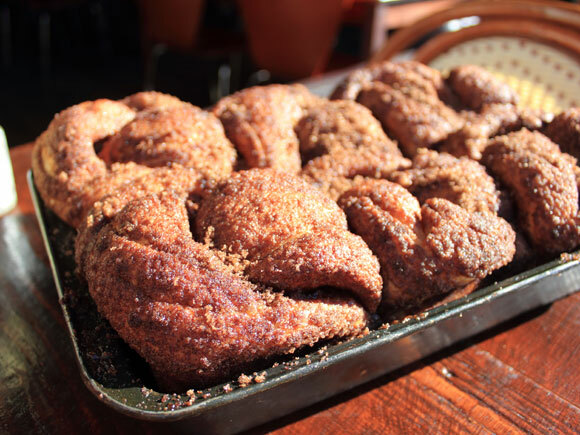 I simply must save room in the morning for part of a cinnamon bun – they’re usually sold out by eleven. So many beers...so little time! My other favorite is the Lamb Burger, served on a Kaiser with a generous dollop of goat cheese. One bite into the patty releases a , followed by a hit of acid from the pickle and the tangy goat cheese. The Guinness mustard ties it all together. It’s a satisfying treat, and was even voted one of the top 25 things to eat in Edmonton in 2011 for Avenue Magazine. See below for the recipe revealed. The wine is fine, and cocktails are classic, but beer is the thing to drink here. There are X premium drafts and Y rotating taps, with an enticing discount during happy hour from 3-8pm. Choose from more than 50 different pilsners, wheat beers, stouts, and ales. There’s even a “Hipster” section, where you can order yourself a can of Pabst Blue Ribbon. If that’s how you roll. Sugar Bowl is also known to host many Cask Nights for Alley Kat. An unfiltered beer is matured in the cask from which it is served, and often undergoes secondary fermentation with additional hops or flavor agents. The result is a less carbonated, yet incredibly flavorful brew. Change can be a good thing, in moderation. Though the cheese plate could use more generous portions, most of the menu adjustments have the intention of improving the overall experience. While the beer list remains, my allegiance to the Sugarbowl will persevere. CBC Edmonton has somehow gotten a hold of the recipes for two of my favorite items on Sugarbowl’s menu. 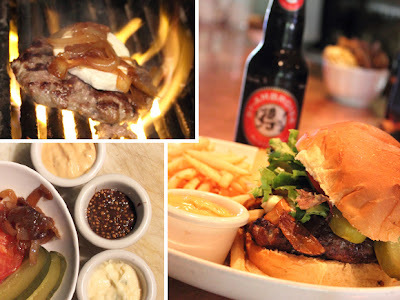 Now you can make their lamb burger at home, as well as the best cinnamon buns in town. I know I could never do them justice. 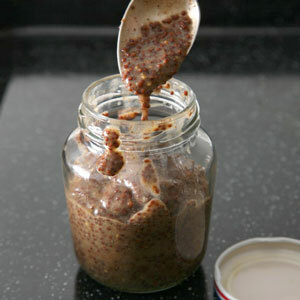 In a small bowl dissolve 1 tablespoon sugar with the yeast in a bit of water. Let it stand until bubbles, about 10-15 minutes. In a large bowl combine the yeast mixture with the eggs, flour, melted butter, water and salt. Mix well, using a mixer or spoon until dough forms. Turn dough onto a lightly floured, flat surface. Roll out into a rectangle. The size really depends on how large or small you want to make the buns. Brush the flattened dough with melted butter and sprinkle with brown sugar and cinnamon. Starting at the long side, tightly roll up the dough and brush with a bit of melted butter. You can sprinkle the buns with brown sugar if you like, or omit this if you want it less sweet. You can also sprinkle extra cinnamon on top if you want. With a serrated knife cut the dough into 12 pieces.Place the buns, cut side down, in greased rectangular baking pan. Cover and let rise for one hour or until it doubles in volume. Keep in a warm place (like above your stove) to help with rising. Pre-heat oven to 375F degrees and bake for 25 to 35 minutes, or until golden brown. Enjoy! Place all ingredients in a large bowl and gently mix until everything comes together. Form into thick patties/burgers. Heat your griddle pan or barbecue until it is hot and grill the burgers 3 minutes on each side. Just before removing from grill, top the burger with a slice of goat's cheese and carmelized onions. Spread one side of the brioche bun with mustard (at sugar bowl we use a homemade mustard made with Guinness beer), and spread the other side of the bun with garlic mayonnaise. Layer the burger on the bun with pickle slices, tomato slices and a few leaves of organic spring mix. Enjoy!!! Cover with plastic wrap and let sit at room temperature for 1–2 days so that the mustard seeds soften and the flavors meld. Transfer the mixture to the bowl of a food processor and process, stopping occasionally to scrape down the sides of the bowl with a rubber spatula, until the seeds are coarsely ground and the mixture thickens, about 3 minutes. Transfer to a jar and cover.